I looked at my Mum and we both pulled a face. 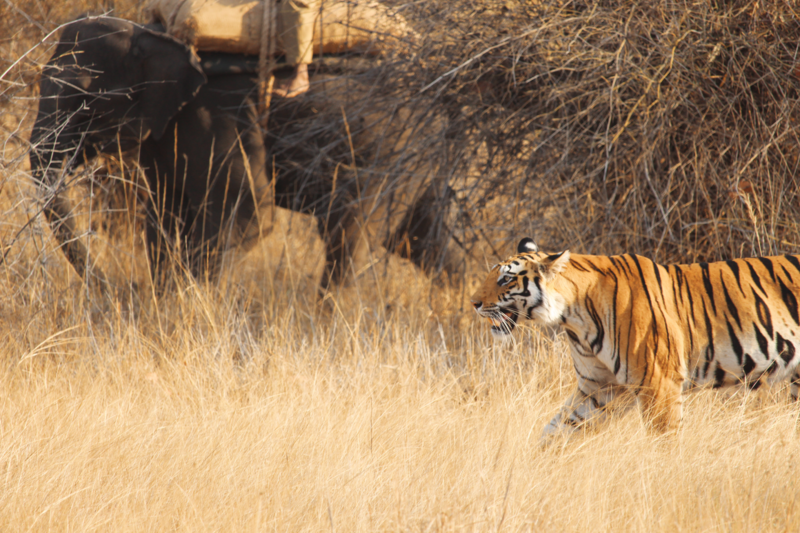 We’d seen exactly zero tigers in our three safaris so far – whilst everyone else had seen at least one. We were getting pretty nervous – we only had one safari left. 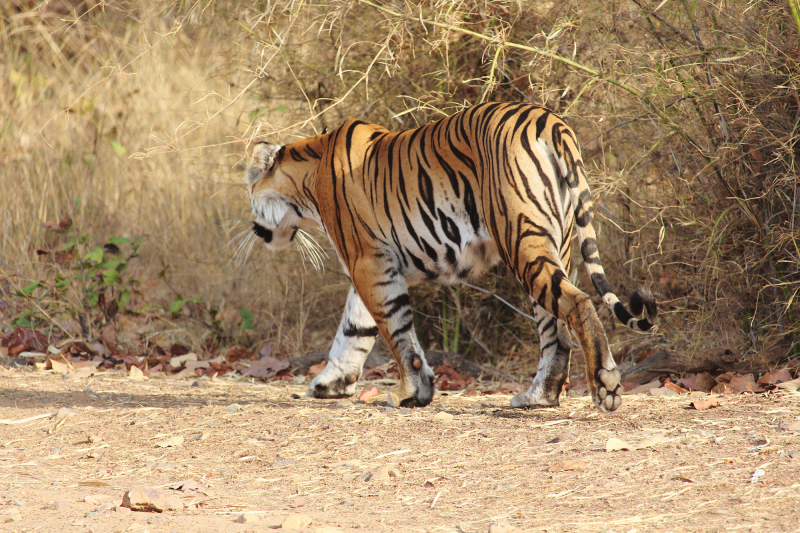 If everyone had had the same luck, I don’t think we would have been so miffed, but given the high rate of tiger-spots – most people had only had one bum trek, we were antsy. It had been a bit of a fustercluck so far, to say the least. 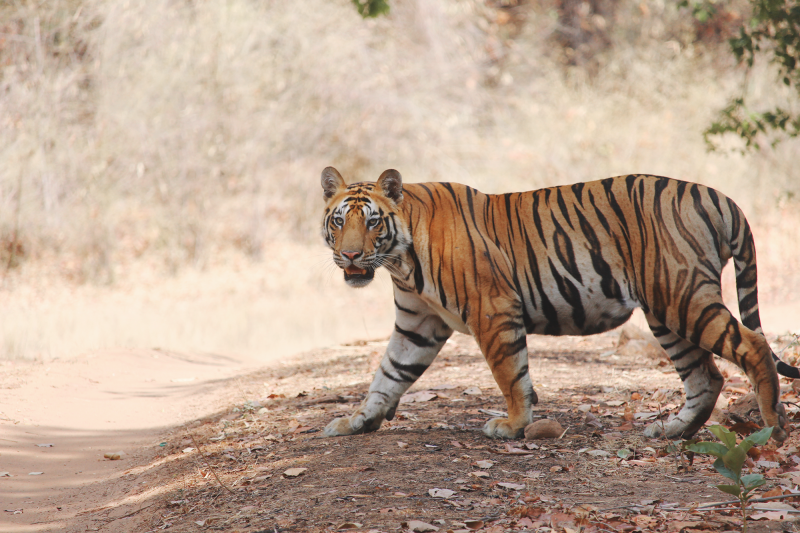 We thought we’d been booked on four safaris, two in the top tiger-spotting zone of Bandhavgarh National Park, Tala, and two in the second-best zone, Maghdi. We turned up and it materialised we’d only been booked on ONE safari, in the zone we had asked not to visit (as it had a low tiger population). 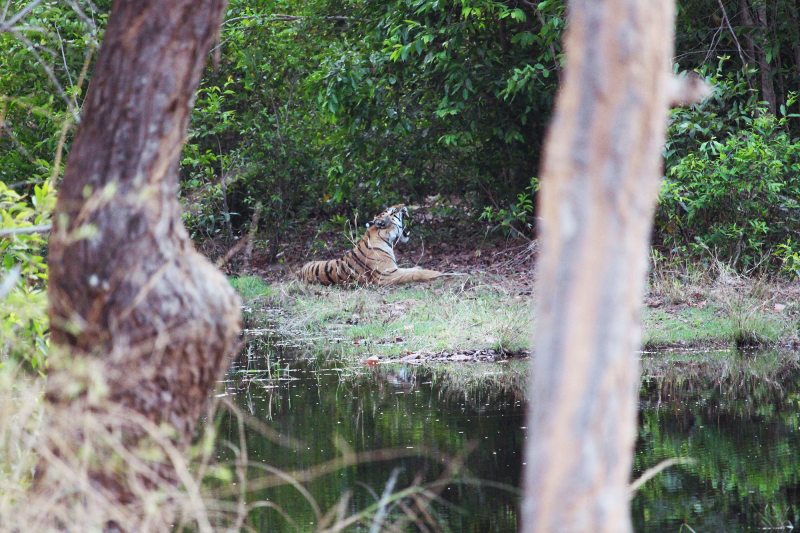 We were devastated – it had cost a lot, in money and time, to get out to Bandhavgarh, and now it looked like we’d be stuck in our hotel room for the next three days. 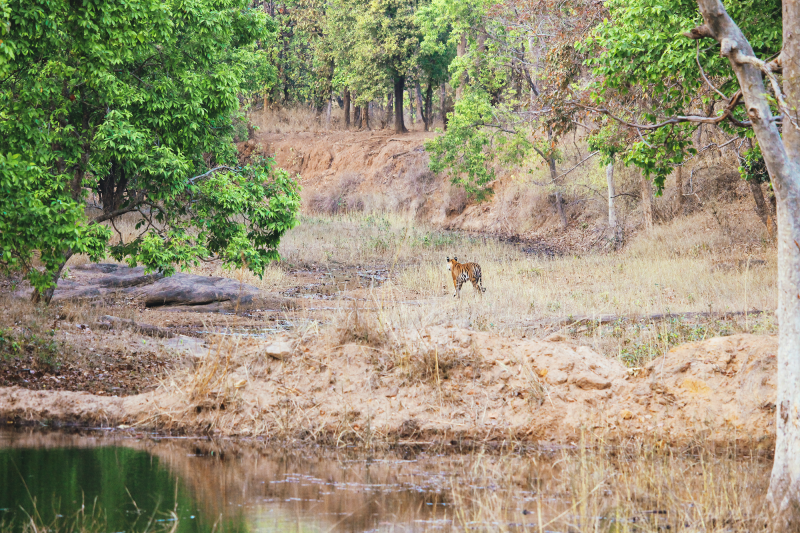 Bandhavgarh has the highest population of tigers of any national park in India – if you’re going to see a tiger, you’ll probably do it here. 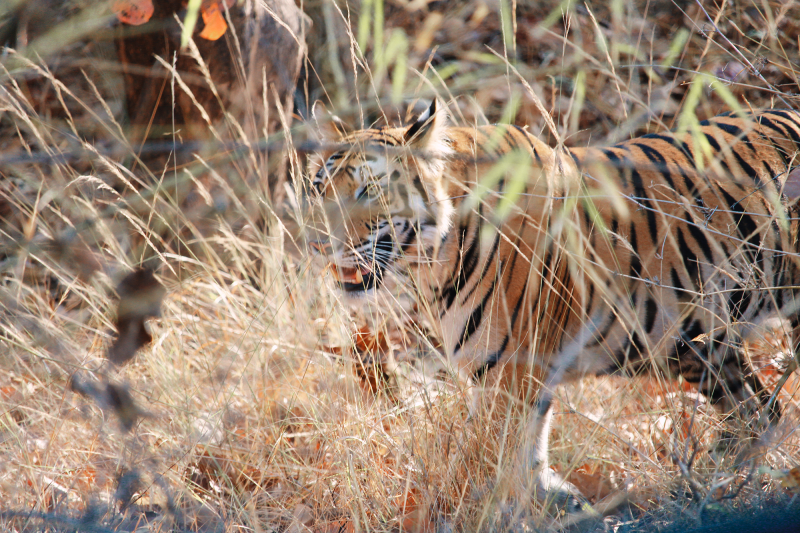 We’d considered Ranthambore, which is much closer to Rajasthan, where we were spending the majority of our trip – but my Mum had her heart set on seeing tigers, and as she knows India very well, we thought we’d get a bit off the beaten path and spend the effort getting to Bandhavgarh. 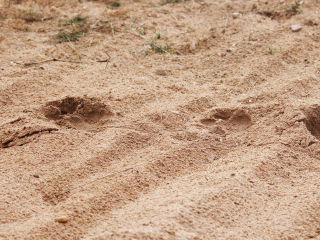 We saw indicators of tigers on our very first safari – scratches on bark, and a lot of footprints. We were incredibly excited. 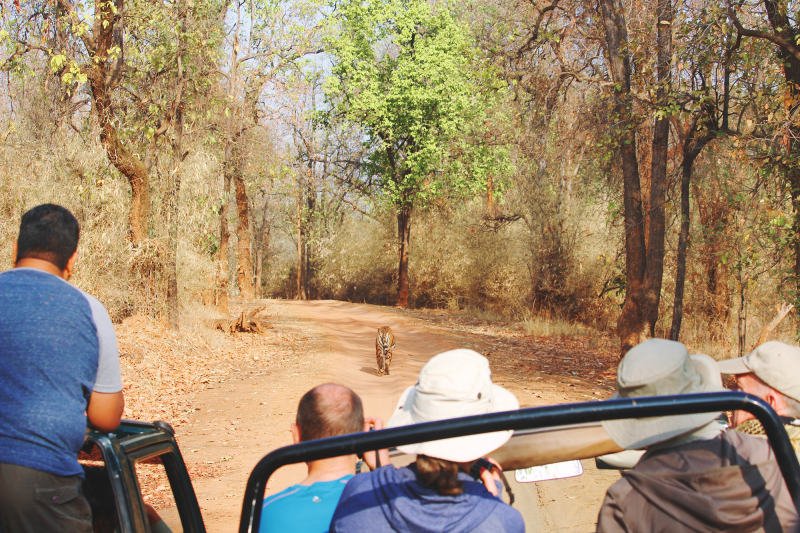 Unfortunately, we didn’t spot any tigers on the first safari. 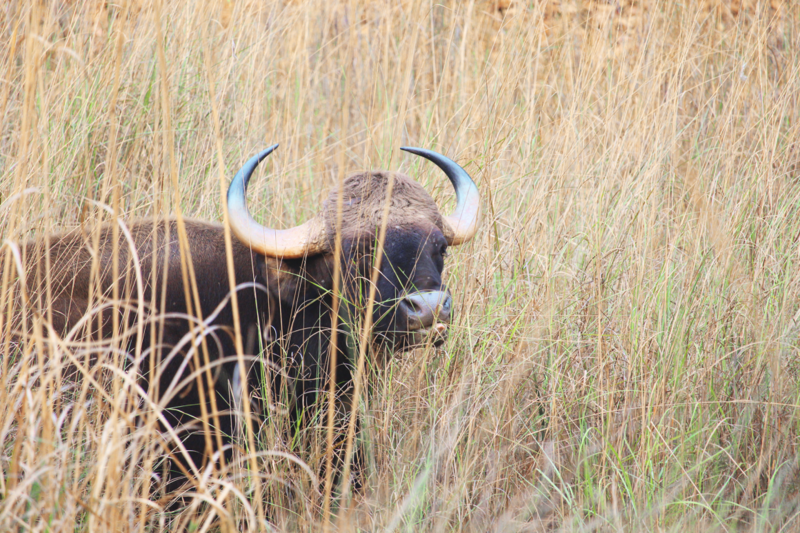 They’re most likely to be seen early in the morning and late afternoon, and so that’s when your safaris will be timed. 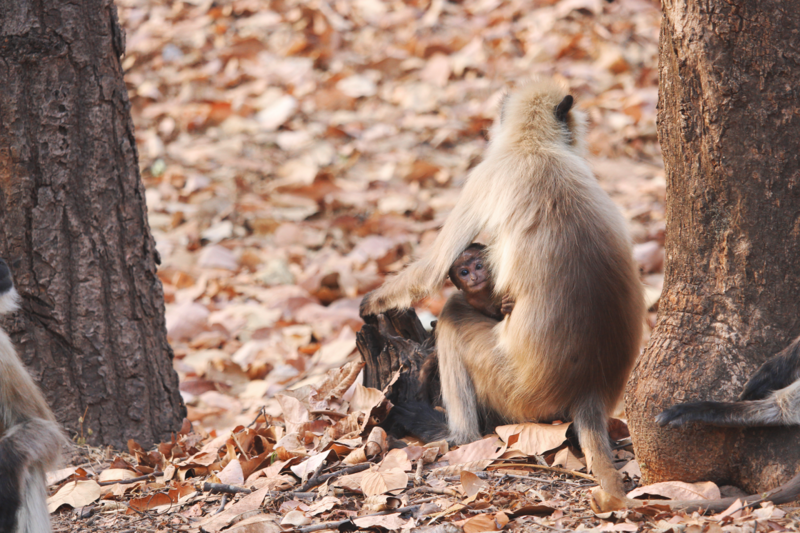 What you will definitely see is a myriad of other wildlife – particularly monkeys and deer. 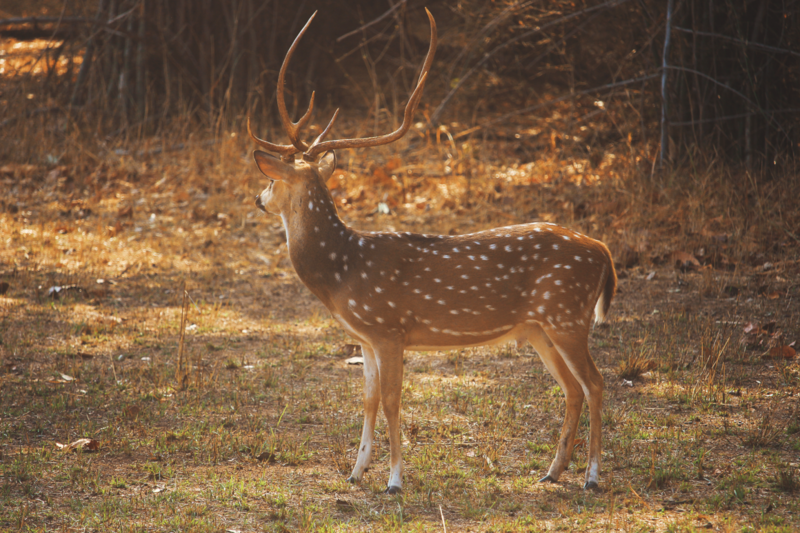 The spotted deer are smaller but ever so majestic. 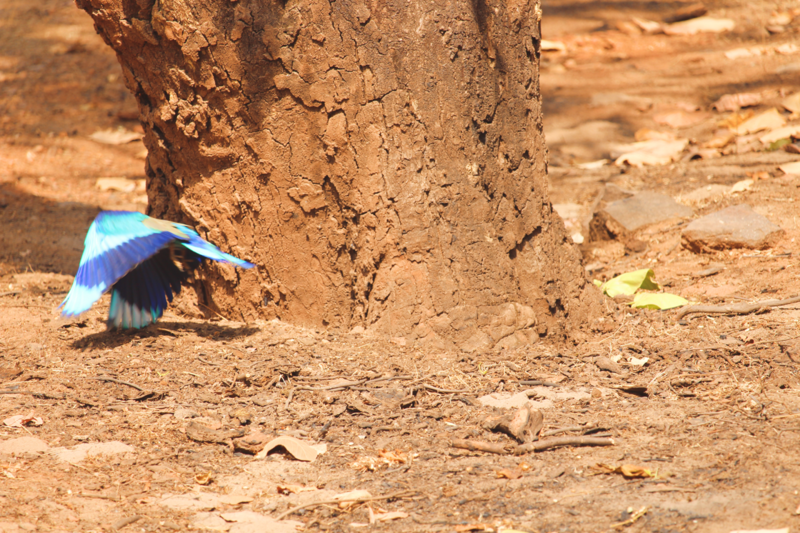 A peacock display – these happen a lot! 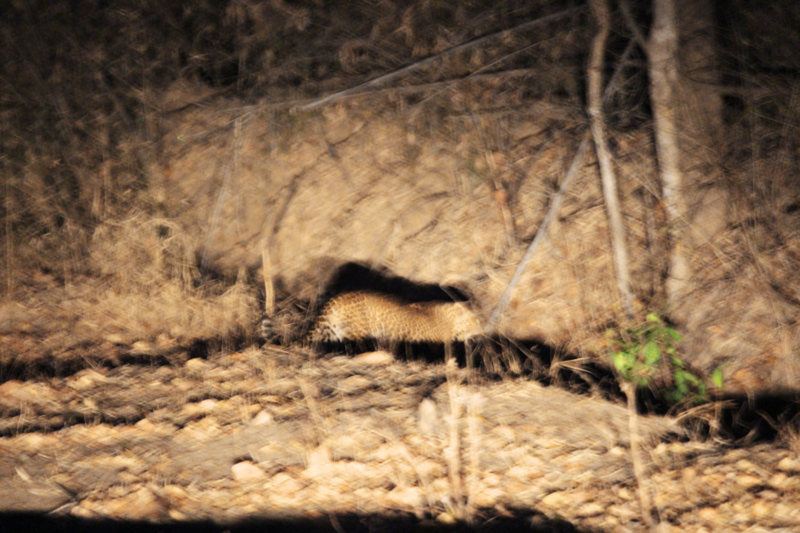 It was gone in a flash – hence why the pictures are so blurry! 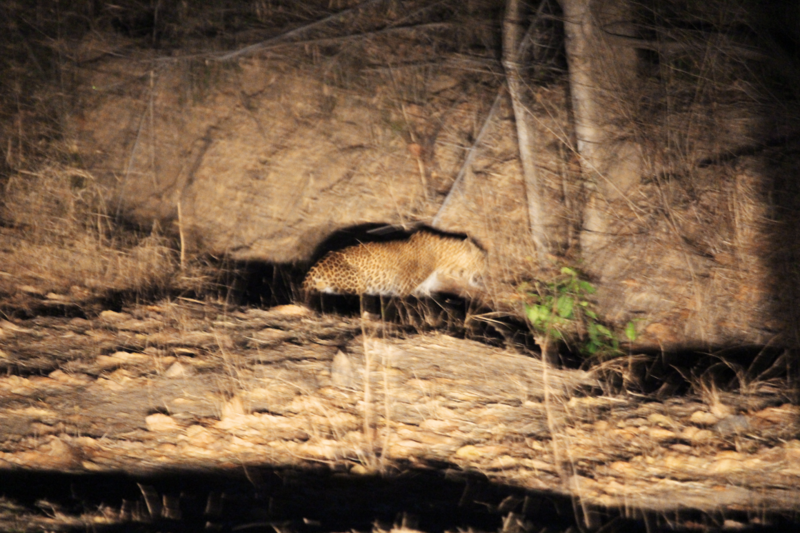 But we finished our first day on a high – a leopard spot, as our driver and guide eagerly pointed out, was incredibly rare! 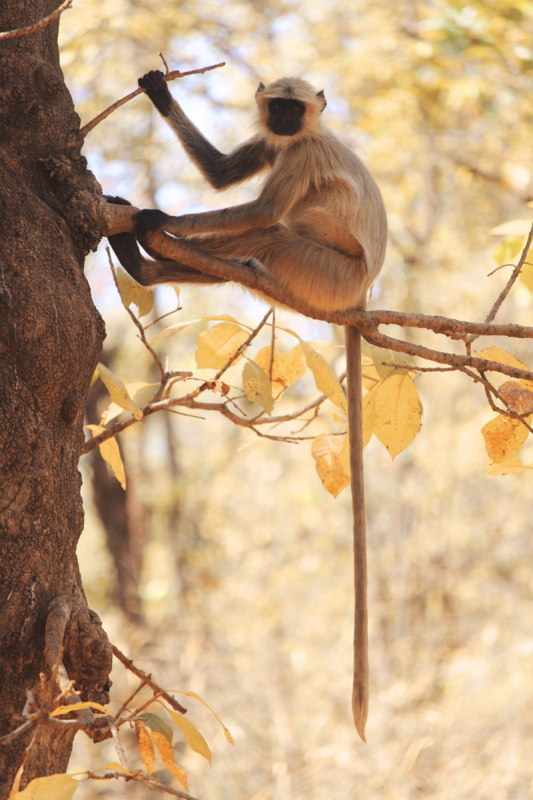 The next day was filled with more monkeys, more deer and more bison. 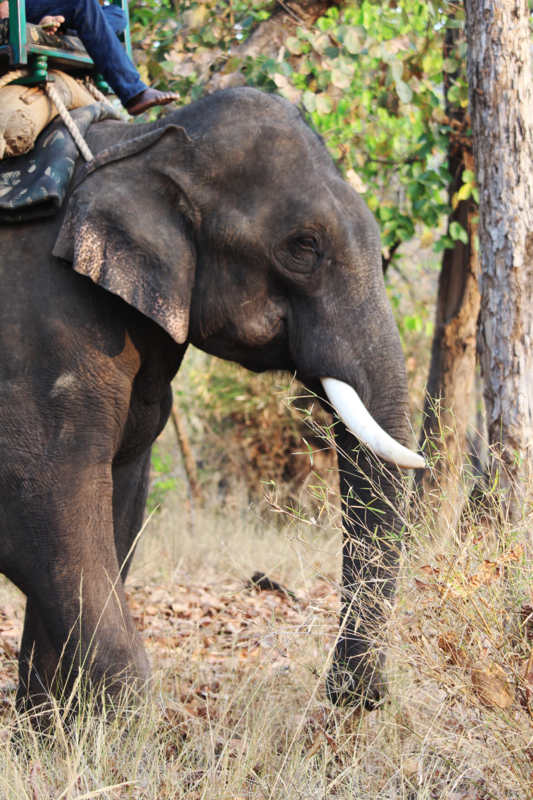 As the safaris hadn’t been booked, we’d had to go on a canter – a wide, open-topped bus, which can’t go down the smaller roads and makes a lot of noise. Our previous safari had been with a kind Dutch father and son, and they’d booked a private jeep. When they saw us waiting to board the bus, they offered the back seats to us – but alas, you have to have a specific kind of permit to go in a jeep. I highly recommend triple-quadruple-checking that you’re booked on a jeep! 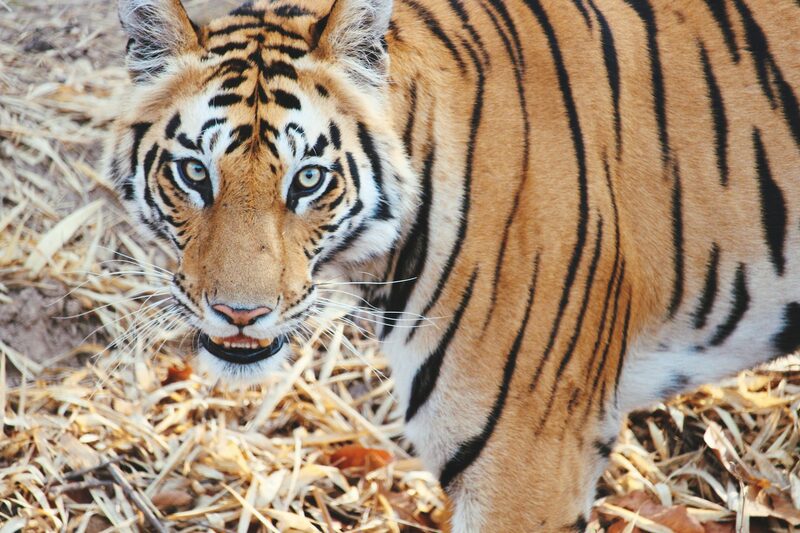 You’ve got next to no chance of seeing a tiger from a bus, and the majority of your time will be spent in the picnic area as the canter can’t go down most of the paths. We were desperate and dejected by our fourth and theoretically final safari. Our hotel had managed to nab us two spots on a jeep going to Tala, and we had it all to ourselves. It was much more comfortable having the jeep to ourselves – though you pay more for the privilege. Jeeps are sold by the car – so if there’s six of you (maximum) in a jeep, you divide the price by six, versus only by two. We’d now been in a six, the canter and the two – two is much more comfortable, but if you’re on a budget try and insist on sharing (though, of course, it depends on how many people want to go on safari). We had been roaming around, when we came across a huge cluster of jeeps on a bridge. Desperately, I craned my head – we were one of the last to the party, and there were by now around 20 jeeps eager to get a look. 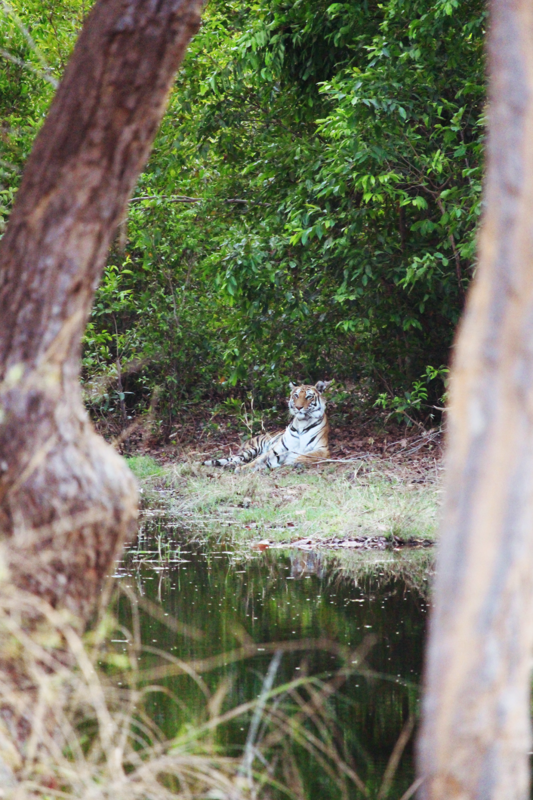 After careful guiding from the driver, finally, across an expanse of water – we spotted our first tiger. 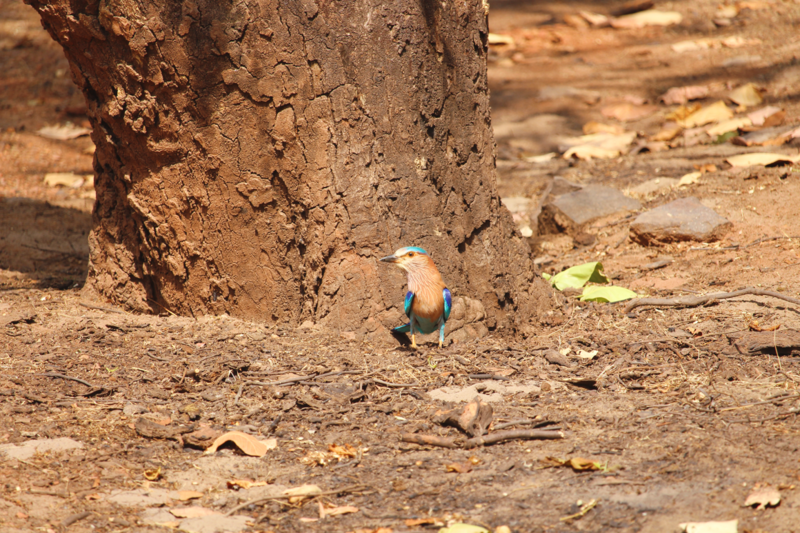 We had spotted a stunning female, lying in the shade under the trees. We stayed watching in absolute stillness as she rolled over, yawned and scented some trees. 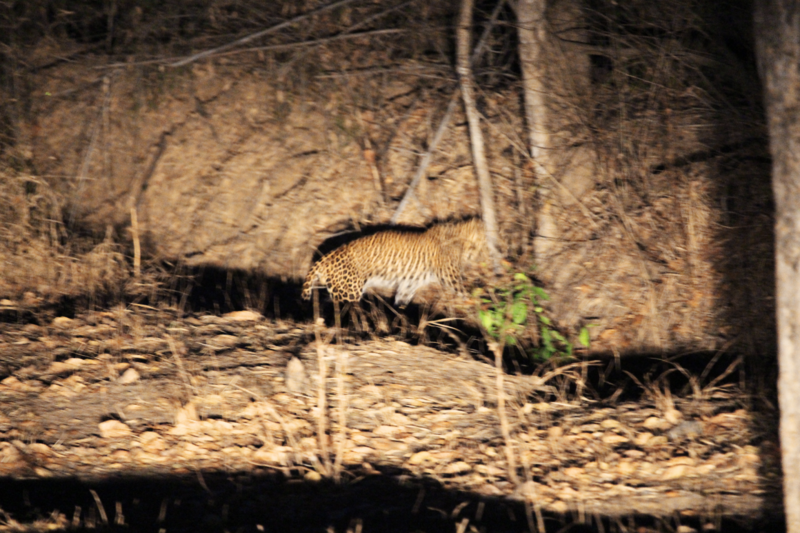 She emerged from the undergrowth, coming right past our jeep! Unfortunately, my hands were shaking so much and I was so transfixed by her, I didn’t get any good shots of her in front of us. 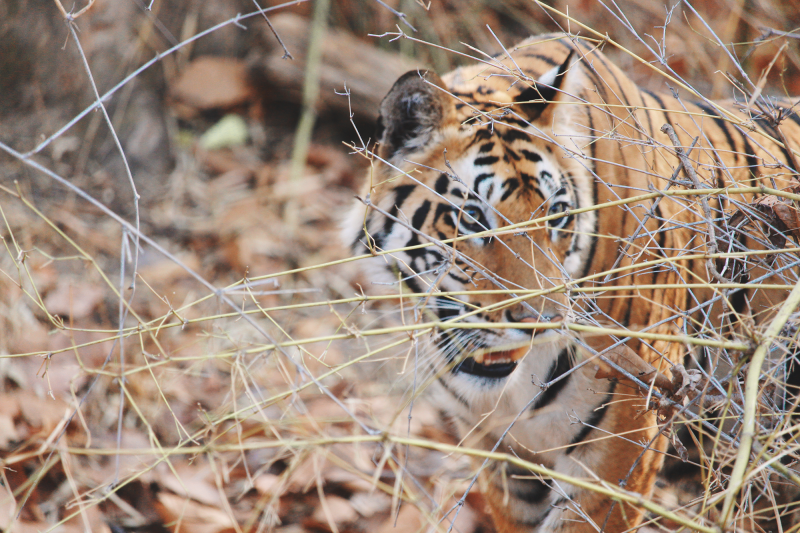 My heart was pounding and I could hardly believe my eyes – she was about three metres from us! She padded around this little lake a little, before swaggering off into the setting sun, leaving us all with fast beating hearts and massive grins on our faces. 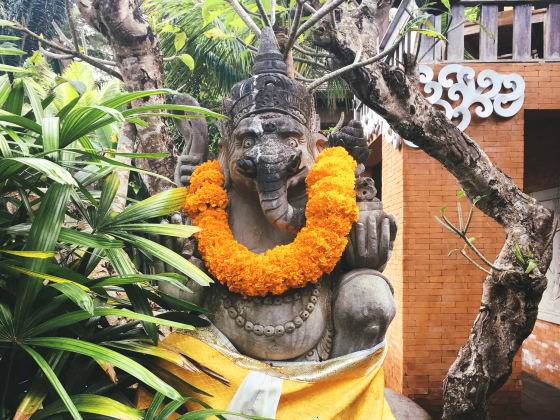 We were on such a high as we came back that when the hotelier at our resort asked if we were interested in booking another, last-minute safari in the morning, we said yes almost instantly (as long as it was the same zone). We had a flight back to Delhi, but it wasn’t until 3PM, and the morning safaris are back by around 9:30AM, so we figured we’d zip down some lunch and hop in a car for the three hour journey to the airport. 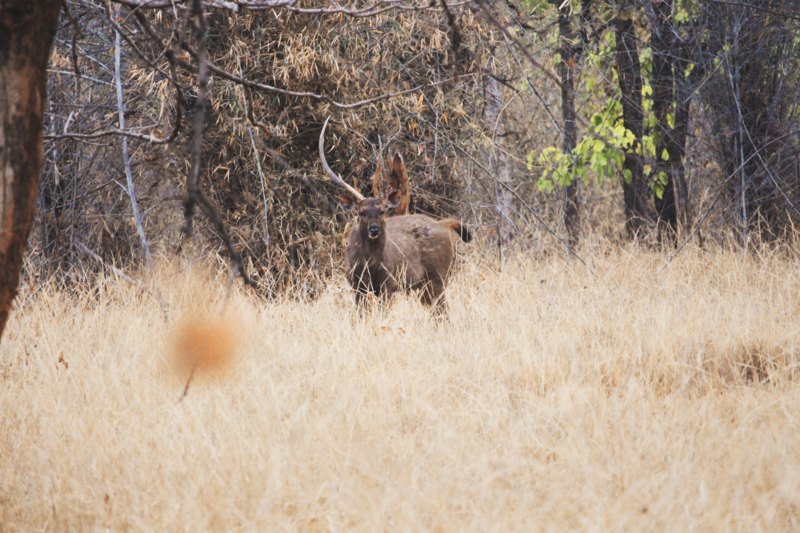 After catching up on the Indian Premier League cricket, we went to bed with smiles on our faces, happy this time to wake up at 4:30AM for the morning safari. 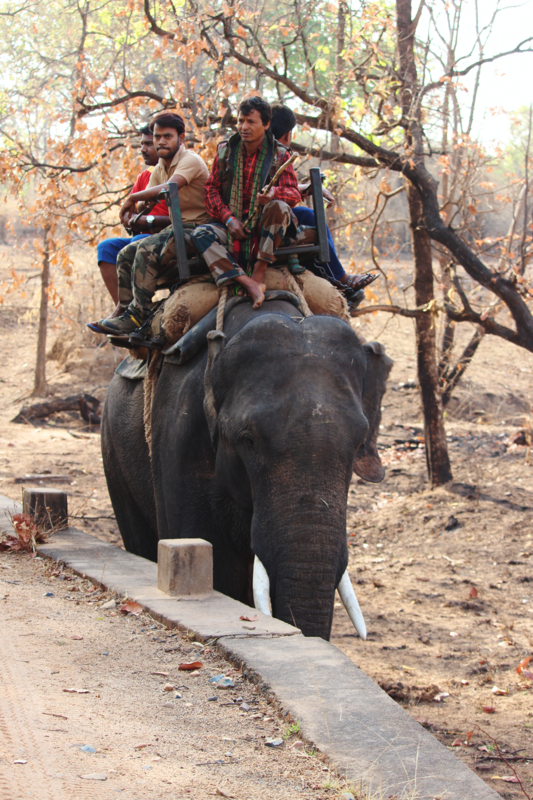 The next morning, we were with a young Indian couple and their daughter, and we set off again through Tala zone. And then, suddenly – a hush fell upon the jeeps. Tigers! 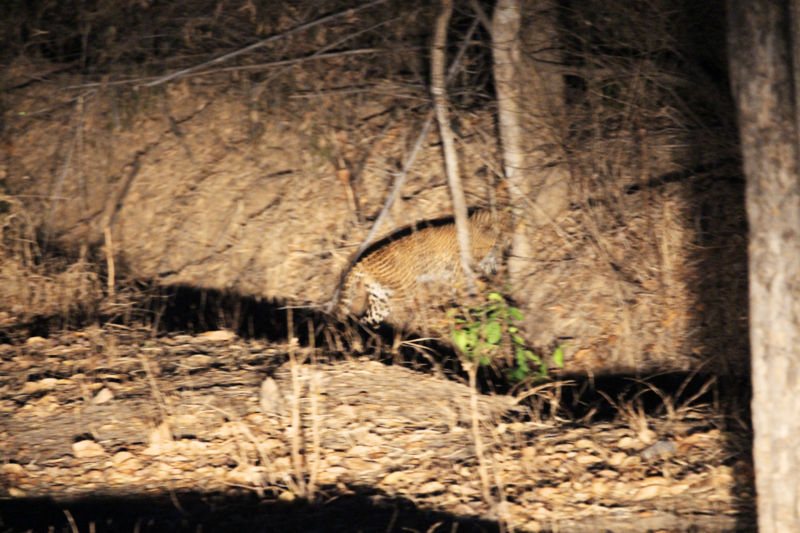 This time, we saw a mother and her cub. 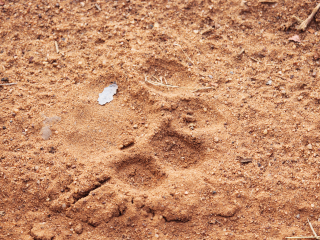 The cub was noticeably nervous, snarling at the jeeps as he trotted past. Look at his foot pad! 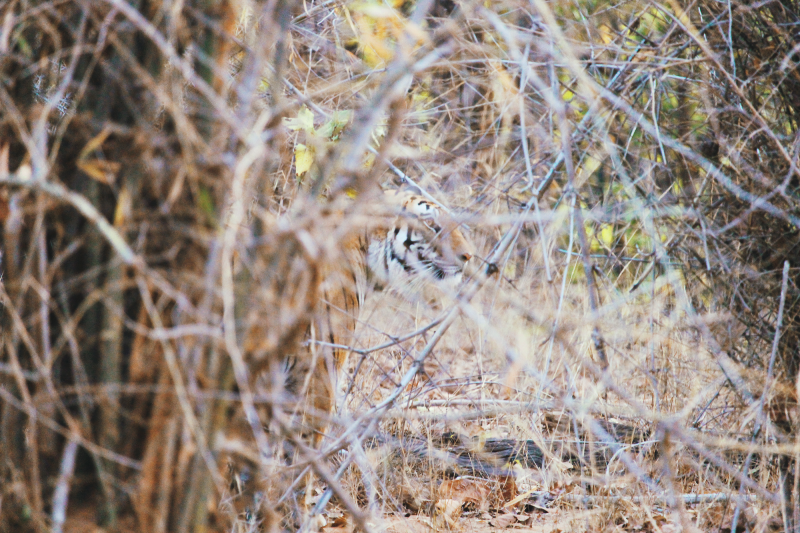 He nipped through the brush, but I could still spy him through the leaves. You can see how the stripes are magnificent camouflage. 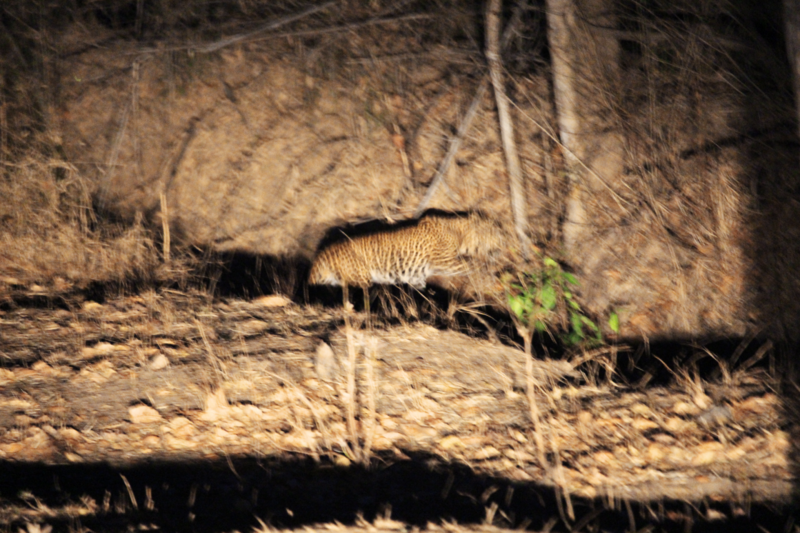 As we made our way back, we also came across TWO male cubs – presumably brothers – wending their way through the jungle. 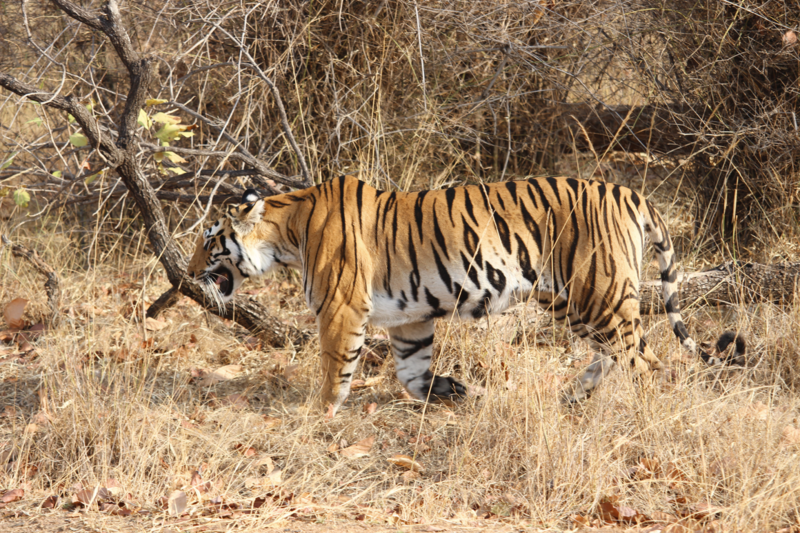 I didn’t take as many photos, as I wanted to enjoy my last tiger spotting; they were clearly wary, and kept to the side. 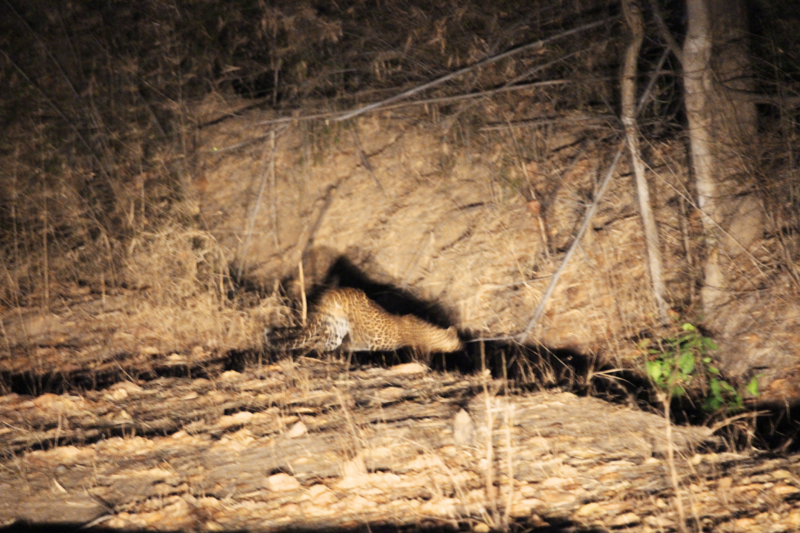 We were a jeep on our own at that point, which made it even more special, watching in silence as they padded away. It was an absolutely magical morning, one that I will never forget. I think my heart was beating ten million miles a minute for almost 24 hours! 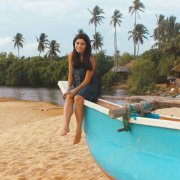 We headed back to the hotel with smiles on our faces, ready to pack up for our stopover at Delhi and on to Kerala (though whether or not we’d make it would turn out to be a story in itself… Though that’s for another post!). 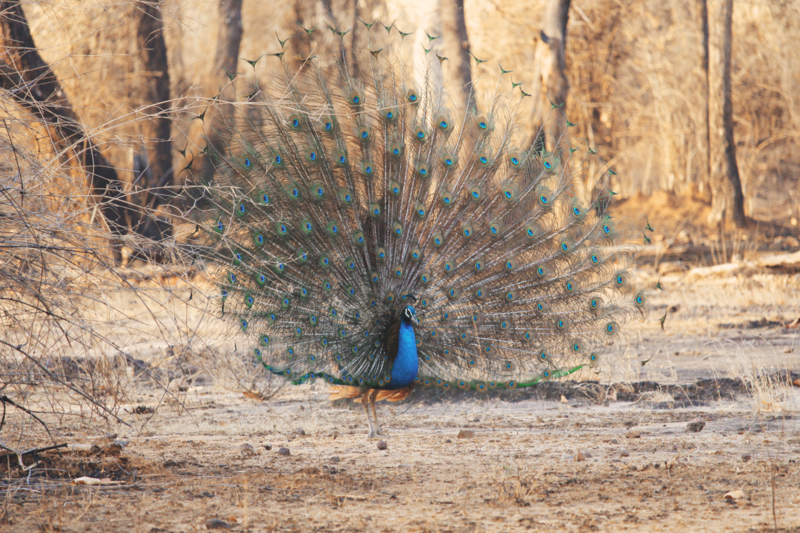 We stayed at Aranyak Resort in Bandhavgarh. 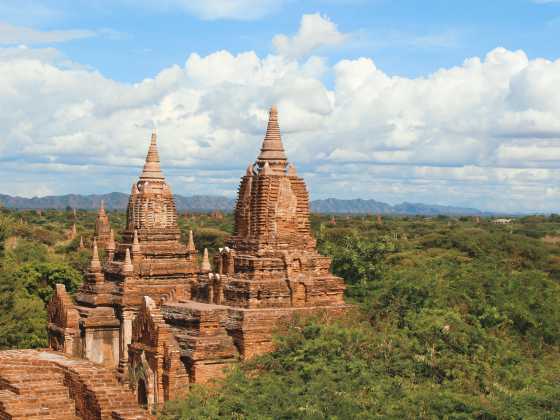 You basically have two options – “luxury” spa or homestay/hostel. Aranyak was lovely, but not luxury in the traditional sense. There was a lovely buffet and big pool, and the staff were absolutely wonderful and bent over backwards to help us during our stay. There aren’t any restaurants in the area; most places you’ll be served food where you’re staying which means if you want specific snacks, bring them with you. We were under the impression all drinks were included and they ended up not being so watch out for that! 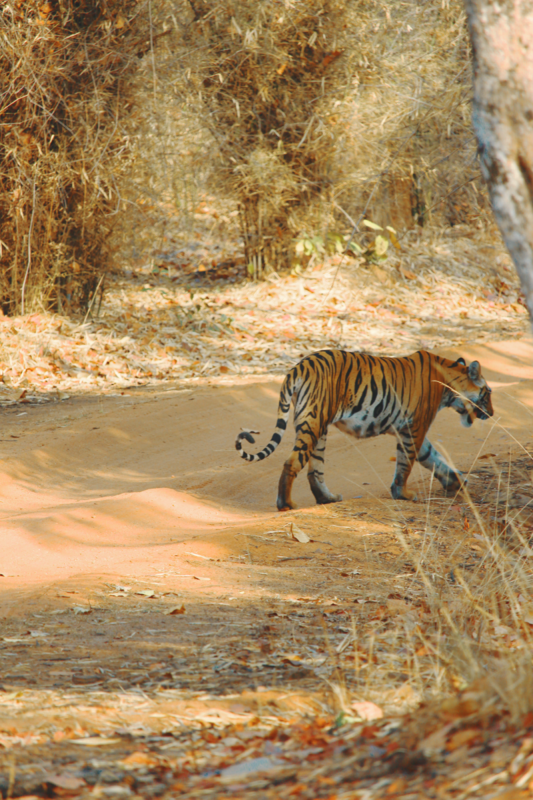 I recommend at least four safaris – as we found, although Bandhavgarh is the place you’re most likely to spot a tiger, that doesn’t mean it will happen first time round! I don’t think you’d want more than four, also, if you saw one on every trip. 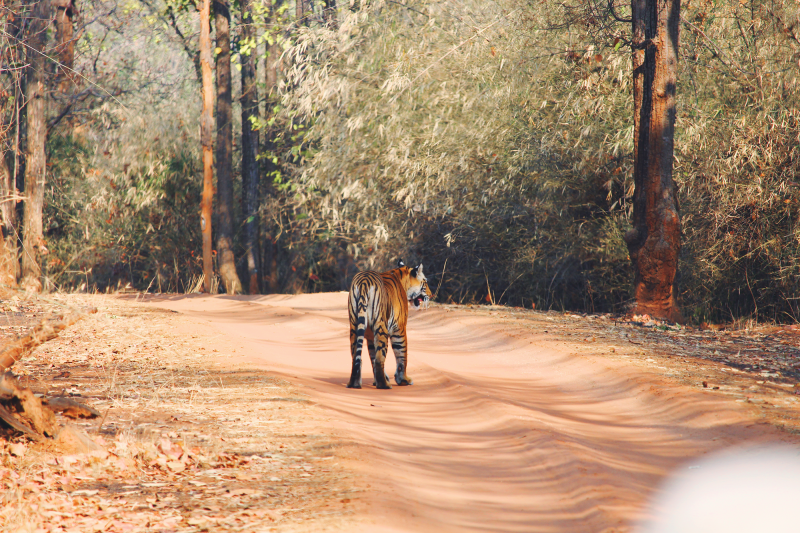 It’s so exhilarating seeing the tigers, but the roaming around and not seeing much can get a bit tiring after a while. You’ll also be exhausted from getting up at 4 every morning! We flew in to Jabalpur Airport, which is fairly easy to get to from Delhi. 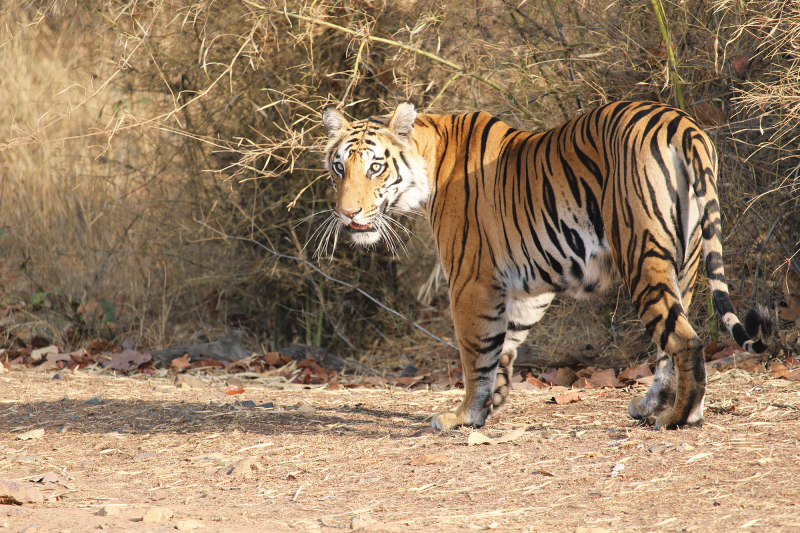 You can also reach Bandhavgarh from Khajuraho Airport. 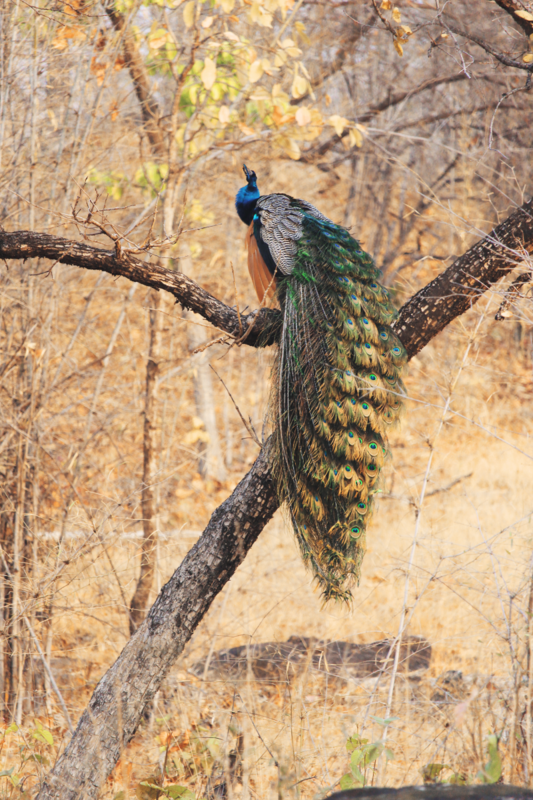 From Jabalpur it’s a three hour drive – so travelling to Bandhavgarh takes a day up in its own right! 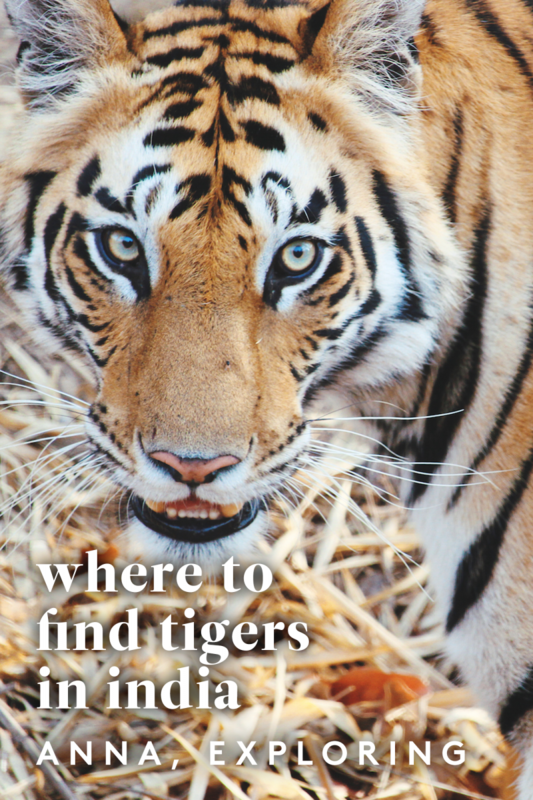 Flights, food, accommodation and safaris we spent about £500 between two of us – which for five tiger spots and a leopard, I don’t think is too bad at £250 each, but it was definitely a splurge on our trip! 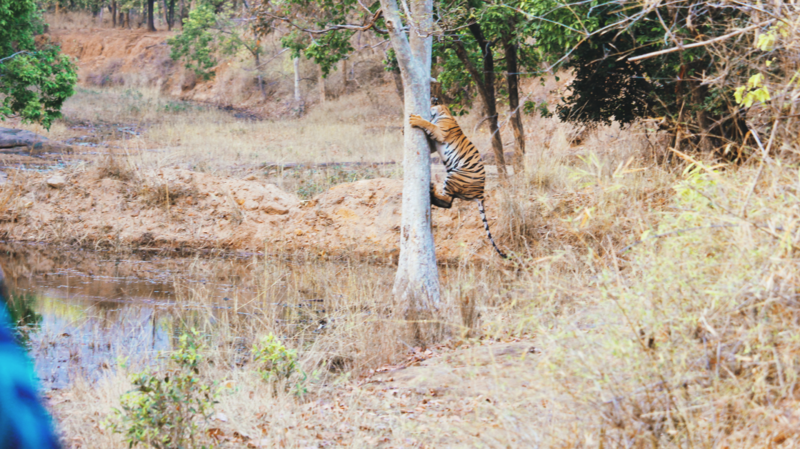 Have you seen tigers in the wild? What’s your best safari spot? 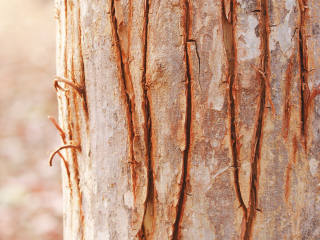 Click below to pin the post for later!